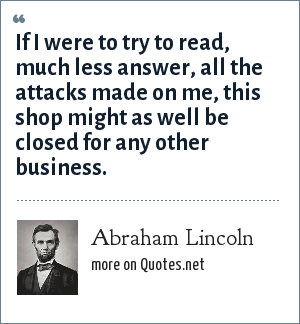 Abraham Lincoln: If I were to try to read, much less answer, all the attacks made on me, this shop might as well be closed for any other business. "Abraham Lincoln Quotes." Quotes.net. STANDS4 LLC, 2019. Web. 23 Apr. 2019. <https://www.quotes.net/quote/2417>.